This post is sponsored by WhiteWave’s Horizon and one of our favorite grocery stores, Albertsons in New Mexico as part of their Earth Month and Every Cart Counts Campaign. I used Horizon’s Cinnamon Snack Grahams for this recipe and was compensated. This April, build a better cart and make small changes that can impact the environment and your diet. By doing this, you’re proving that every cart counts! S’mores!!! I have not met a single person on this earth who does not like them! Actually, when you think about it, this world has completely gone s’mores crazy. Seriously. It has! 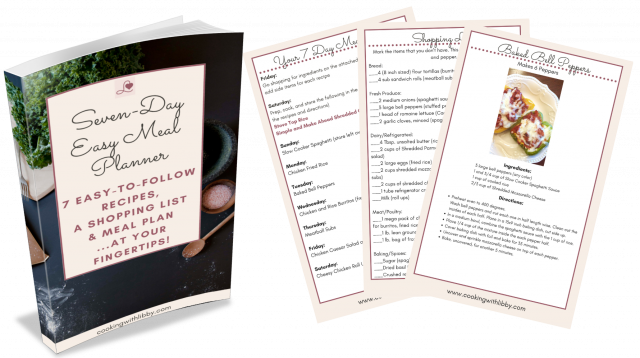 If you log on to Pinterest and type in the 6 letter word, a slew of recipe suggestions will pop up. S’mores milkshakes s’mores snack mix, deep fried s’mores, s’more cookies, s’mores icecream, s’mores fudge, s’mores doughnuts…the list goes on and on! I have even seen recipes that add a second flavoring of sorts to the original flavoring of them (think raspberry s’mores bars). 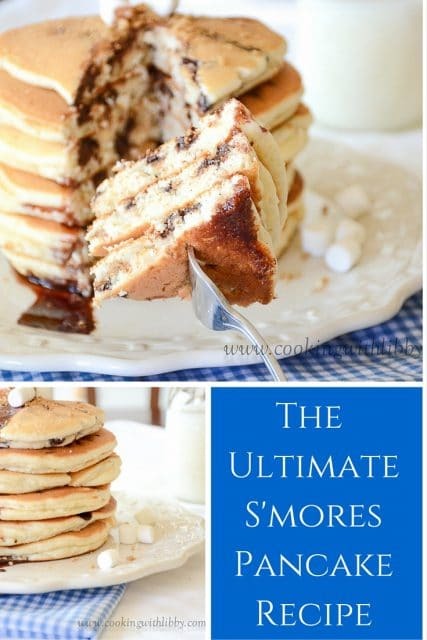 With all of the diverse ways of transforming this popular camp fire dessert into different recipes, it was only a matter of time before someone came up with a recipe for s’mores pancakes. My children absolutely LOVE anything s’mores flavored. If it’s made with graham crackers, marshmallows, and chocolate sauce, they are on it! 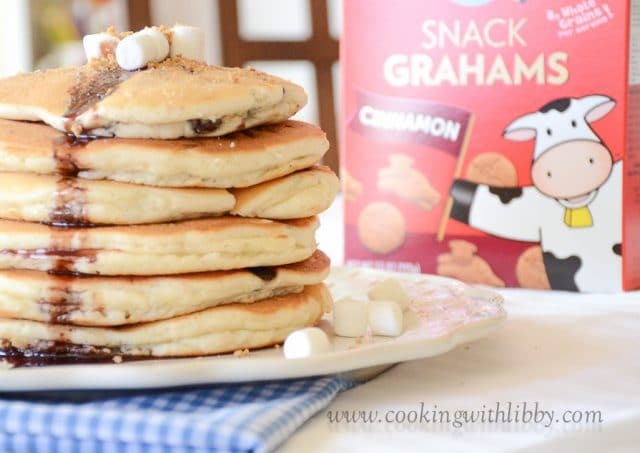 We have had this recipe for s’mores pancakes for a few years and up until now, I’ve always been a huge fan of using regular graham crackers to place inside of the batter. However, using these Cinnamon Snack Grahams from Horizon will definitely suffice as well! They are made with Organic Wheat and each individual serving contains 8 grams of whole grains. My children have taken a huge liking to them and request that I pack them for their school lunches every week. I don’t know about you, but I definitely feel like I made a healthy choice when I purchased them! 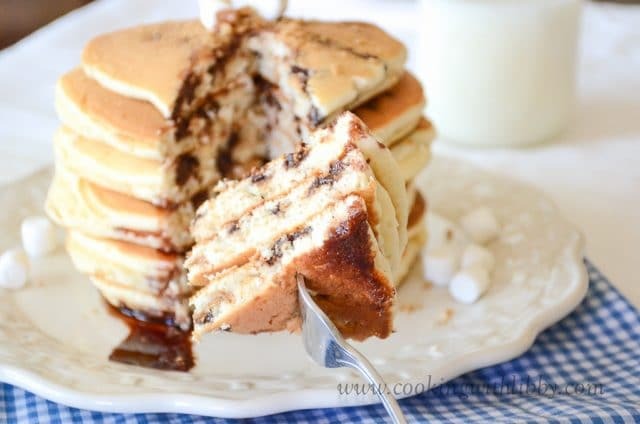 Getting back to the recipe….these pancakes are a real treat! If you have ever cooked or baked items that contain marshmallows, then you know that they tend to disappear when they are fully baked. These are always fun to eat with children, because they can witness the disappearance of the marshmallows inside the pancake as they eat their breakfast. The added s’mores flavor is just icing on the cake. Heat a non-stick griddle/pan to medium low heat. In a medium mixing bowl, combine pancake mix, milk, sugar, egg, and chocolate chips. Place 1/2 cup of the batter onto the griddle/pan. Take 8 mini marshmallows and place in the middle of the batter. Cover marshmallows with 1/2 teaspoon of the crushed graham snacks. Cover marshmallows and graham snacks with 2-3 Tablespoons of batter. The batter should cover all of the marshmallows. Cook pancakes on each side for 2-3 minutes. 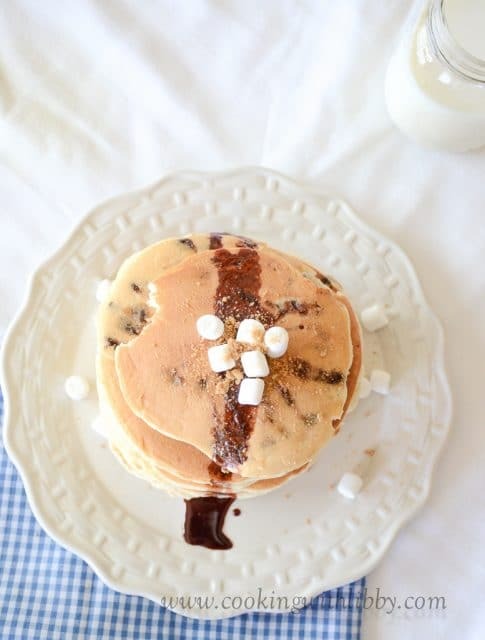 Top each pancake with a few drizzles of chocolate syrup, a few more marshmallows, or crushed graham snacks if desired. Crush graham snacks the day before and store in a plastic bag. You MUST use mini-marshmallows with this recipe. DO NOT use the jumbo or big ones or else you will end up with a sticky mess...even if you cut them up. Do not use the marshmallow creme either. Stick with the minis. Also, stick with using milk and do not substitute it with buttermilk.